I had a long 400 mile drive last Sunday and stopped briefly near Crowden at the North end of the Peak District. 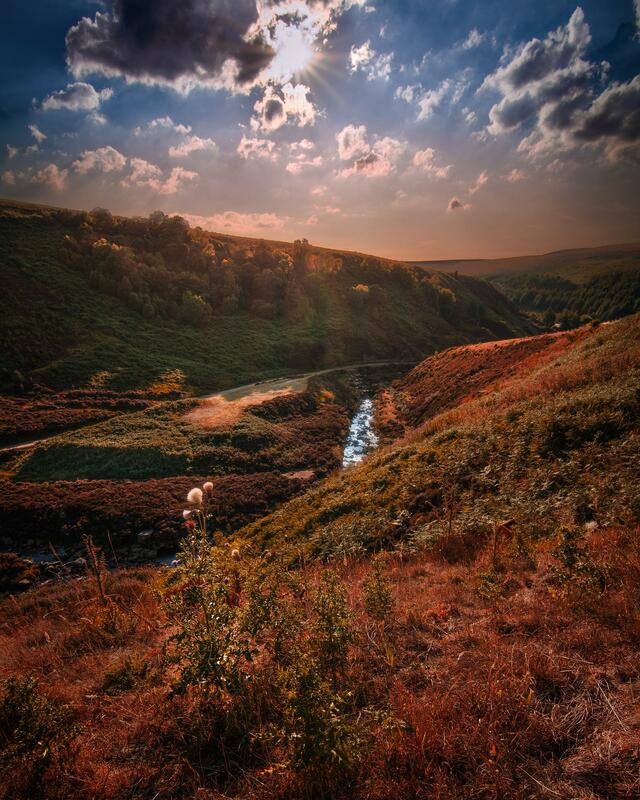 It’s been very hot and dry in the UK this summer and the valley below is a river which links the Torside Reservoir with the Woodhead Reservoir, both of which were very low on water. It was late afternoon and the sun was still high, so not ideal conditions for a photograph and to make things even more tricky, the composition which I wanted to get meant pointing the camera straight at the sun. I took three shots and different exposures, one for the sky, one for the lighter ground and one for the shadows, then blended them in Photoshop to get the photograph below. After spending about 10 hours in the car, I am so glad I got the aircon fixed last month!